Adaptive learning is one of the hottest topics in elearning right now. One of our favorite thought leaders, Rebekah Clarke, talked to us a few weeks ago about how adaptive learning is one of the most important elearning trends of 2019. I thought it was about time to dive in a little deeper: what is adaptive learning, anyways? Adaptive learning is, to some extent, exactly what it sounds like: learning that adapts to the user’s needs using scalable technology. This can appear in a number of different ways. It can be as simple as a quiz that chooses questions to ask based on the user’s previous answers. It can be a complex algorithm that predicts what courses will be most relevant to the user next. Researchers are finding, over and over, that the relevancy of training content is a huge, huge factor in learner engagement in corporate training. Adult learners want to look at what they need to know, and no more. They will brutally quit in the middle of courses if they already learned enough information. They will skip boring material. They know what they want and they don’t have time to waste on anything else. Here’s where adaptive learning comes in: it’s an attempt to determine what your employees are most likely to want or need and deliver it to them. Automatically. Adaptive learning predicts what topics are both more interesting to learners, as well as what they already know and could stand to skip. It can even determine what learning style the learner responds best to (whether it’s gamification, video learning, or something else) and suggest the version of the course that best suits their learning style. This is especially helpful in an elearning environment with a massive course library. Learners might have a hard time sifting through all that content to determine which leadership courses or business skills classes are best to take. Adaptive learning can help suggest the best content for them to take. Adaptive learning can also help sell more courses in an ecommerce environment: by becoming better at understanding what a learner wants, the next course a learner buys might just be the one suggested via adaptive learning. There’s been a lot of research behind adaptive learning in the online classroom. It’s effective enough that it’s already being widely applied, especially in higher education. It can likely be applied to corporate training, especially since some of the studied courses are not dissimilar to courses that might be taken by working adults – like accounting. An accounting course at Colorado Technical University that used adaptive learning discovered a 27% increase in the pass rate and a 9% increase in retention rate. Another study indicated that students in adaptive learning courses did 15% better than fellow students in the traditional course. There are some studies that also show a negligible impact, but the sheer amount of data and the fact that adaptive learning offers a solution to a problem of engagement and relevancy in corporate training makes me lean towards believing that it can make a positive difference in LMS environments. The business impact of adaptive learning lies in the way that it saves time on learning. Being able to skip parts of courses that learners already know can cut the training time by a lot. It also increases learner retention (so that the training doesn’t have to be repeated). Especially in companies dealing with thousands of employees, this is huge. It can save thousands of hours or even hundreds of thousands of hours in work time that would have otherwise been spent on training. Adaptive learning makes use of either adaptive path branching or artificial intelligence (AI). Adaptive path branching involves pre-set learning pathways that respond based on user input. Branching has the ability to be very complex depending on the complexity of the course. Branching is a great option because it can direct learners based on pre-defined criteria. For example, if a student scores very well in a course, they can be directed to the next chapter. If a student does moderately well, they can be directed to additional learning and reinforcement activities. If they perform poorly, they could be asked to retake the course. This gives the designer control over what content the learner is going through. Branching can also give additional data that can be useful in tweaking or adjusting courses. For example, if an exorbitant amount of learners are redirected to reinforcement activities, it could indicate the initial course could use a more effective design. Branching is still in vogue but many companies are starting to use artificial intelligence to create adaptive learning. 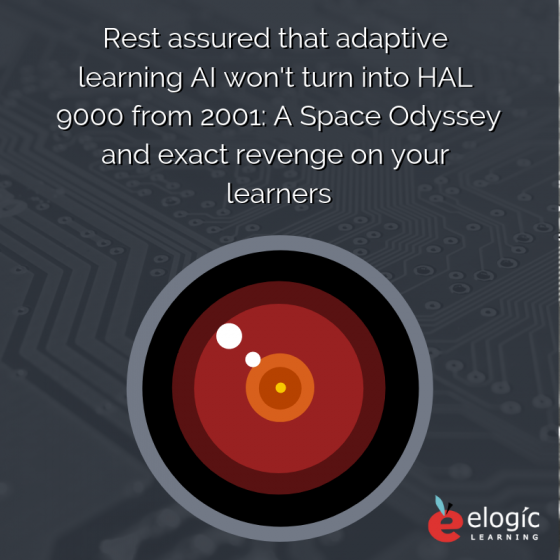 While AI might bring to mind HAL 9000 from 2001: A Space Odyssey, I promise that current AI isn’t going to take over your classroom and exact revenge on you or your learners. Adaptive learning courses often start with an assessment that will give the student a basic idea of what the student already knows so that they can make the course relevant. With every bit of new data as the student proceeds through the course, the algorithm will adjust to personalize. Beyond understanding the student’s level, there is software that will track student engagement and emotional states and attempt to predict knowledge retention. It can strategically order material in order to combat the forgetting curve. It can also provide instant feedback loops and create personalized learning paths. There is also the potential for software to become aware of what types of courses learners prefer and suggest a version of a course that will be most engaging. For example, if there is a video course and a game course that both cover the same material, the AI could choose the course that best fits learner preferences. How Does Adaptive Learning Change the Instructional Designer’s Role? Reading this, your first instinct may be that adaptive learning removes the role of instructional designer. But the opposite is true. The golden rule of computer science applies to adaptive learning too: garbage in, garbage out. It takes a talented and dedicated instructional designer to feed effective information to the system. In adaptive learning, the alignment of course objectives to content and assessments becomes more important than ever. The adaptive learning can help the instructional designer as they update and design further courses, too. The data gathered as students take courses can help further pin down learner engagement. This information can help guide the instructor in where training needs to go next. After all, AI or branching don’t stand alone as adaptive learning model. Like we discussed with Kathleen Kruse a few weeks ago, integration with analytics helps make a more complete learning journey. It helps you understand the behavior patterns of learners and see the weaknesses of the course. For some instructional designers, this will allow them to focus more on creating effective content and less on time spent curating learning paths. We still have a lot to learn about the possibilities of adaptive learning, but right now there are already concrete ways that adaptive learning can make an impact on your business in saving time and money through more effective training. It can also positively change learner relationships with learning and the way instructional designers approach training design. Having further doubts about the benefits of personalized learning (the umbrella under which adaptive learning falls) as a whole? Read on about how personalized learning is the future of employee engagement.